Go back to the 80s, and grab yourself a pack or 2 of Walkers Snaps, only 10p each @ Home bargains, which I found in the Bletchley store. These are usually around 40-45p each, but at 10p, it's about the same price they were in 80s, and the Spicy Tomato taste from memory doesn't seem to have changed at all, so stock up while you can. Other crisps deals in Home Bargains..
Are these the tiny tubes?? T'was always the toughest decision of my day back in 1979 - tomato snaps or beef potato puffs to go with the mint viscount? I think my earliest memory of buying these would be about 1979 for 5p a packet, which I used to buy along with some Black jack chews, hubba bubba, and a few chocolate tools (keep it clean!) when I took our Cresta and Corona fiizzy drink bottles back to the shop to get 10p! which was a much better way of recycling bottles, plus I think they tasted better in glass bottles rather than plastic.Ah, those were the days, and yeah I remember the cheese ones, but I haven't seen them. This is what hot deals is all about! Vinegar flavour used to be good too, these tomato ones don't taste like they used to ! Sweet, will bag some tomorrow! Thanks!! Heat Added. Thats christmas dinner sorted. Score! I cant see piglets, I NEED that bacon feeling. None in my HB yesterday, or would have stocked up, quality crisps. Bargain for one of the best crisps out there! Hopefully they'll have replenished the shelves with more snaps today for you!.I noticed that like most shops these days, they don't have enough staff, certainly in the Bletchley store, most were on the tills, so very little chance of seeing the shelves restocked until the next morning I guess, unless they have night staff?.Anyway, good luck finding some, I'm hoping to go back to Bletchley for some more tomorrow! as we've eaten half of the packs we'd got already! They sell them in my petrol station just across the road, so can grab them whenever..
Oh my!! Just seen the football snacks in the photo!! I think they were bacon flavour Classic!! Does anyone remember a cheeesy type snack.... in the shape of a smile?? can't remember what they were called but they were lovely!! The cheese version were horrible, these rocked though! No space raiders either :(. 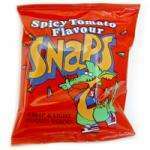 I remember those fangs crisps though, they were ace! Love these bought 20 odd packets yesterday, preffered the cheese flavour though, which you can't seem to get. Nearly as good as the old style ghostbusters and hero turtle crisps. Love these bought 20 odd packets yesterday, preffered the cheese flavour … Love these bought 20 odd packets yesterday, preffered the cheese flavour though, which you can't seem to get. Nearly as good as the old style ghostbusters and hero turtle crisps. I just need Bugles to come back!! Hmm, Burtons Fish n Chips, lovely. BTW, anyone remember the 'Chicken in a basket' crisps which I think were M&S's own brand, used to love 'em! :O You guys do know that they've been around ever since right? 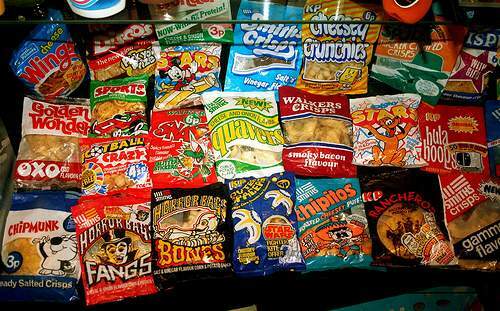 bring back meanies, pickled onion flavour also cheese flavour thinga me jigs.. I remember some "hedgehog flavour" crisps from childhood, they were great - anyone remember them?